Haomei is a top aluminum bus bar manufacturer and a leader in the design and manufacture of fabricated aluminum bus bars and aluminum bus bar systems for high current secondary AC and DC applications. Aluminum strip for transformer is used in transformers for electrical engineering and in power distribution which means in power plants and substations in local distribution networks in wind power industrial plant. Haomei aluminium offer 1060, 8011 aluminum strip for caps, 1060 aluminum strip is easy to make and cheap price, in many countries, 1060 aluminum strip for pharmaceutical caps is very common. Our Aluminium Strip for Lamp base cap materials combines strength and high formability with high resistance to softening in vitriting. 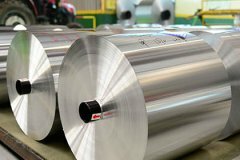 1100 aluminum strip and 1100 aluminum sheet are both available for various applications including chemical storage and processing equipment. 1060 aluminum strip has temper of HO,H12,H14,H16,H18,H22,H24,H26 and so on.